Trainings & Musings by Sasha W.
It’s getting to that holiday time again, and many of us will be spending time with our families, given and chosen. If your family is anything like mine: South Asian, upper middle class, and oftentimes conservative, you’re starting to wonder how you will navigate the hard conversations that come up year after year. You’re beginning to feel the dread. You’re gearing up to hold and argue about the enormity of what’s going on in this country right now. How you will argue with racist aunts about Mike Brown’s death, listen in disbelief to your father stand up for the NYPD, and feel the frustration build. Change starts small, and the revolution starts at home. For those of us who are queer, it’s not always safe to directly confront our families of origin, if we are even still in touch with them. However, I want to challenge us to have the hard conversations when we can. To push our own growing edges, and to sit in the discomfort that comes with challenging our people on our racism. On pushing back on our communities’ anti-Blackness. As non-Black people of color, this is our work. Our work. Nobody else can do this for us. Nobody else should have to. Ella Baker used to ask “who are your people?” as an entry point into movement work. I know my answer. My people include my family, and I refuse to leave them behind. This year, I want to be ready to engage my family in conversations about Ferguson, about Staten Island, about police brutality, about how and why #BlackLivesMatter should matter to them, too. This is geared towards informal conversations, for those moments where you’re cooking dinner together, watching TV, or just catching up. If you’re looking for curriculum to run a more formal workshop geared at challenging anti-Black racism in South Asian communities, I encourage you to check out QSANN’s guide here. These are some of the strategies I’m planning on using to engage in these hard conversations. I invite you to add your own suggestions to the list. 1. Ask about your family’s experiences with the police. You might be surprised. As people racialized as brown in the U.S., many of our folks have had hard experiences with the police. We haven’t, as communities, experienced nearly the same degree of police violence that Black people have. But there’s a starting point here. Ask if your dad has ever been pulled over unfairly by the police. Ask if you mom has ever been afraid to pass through TSA at the airport. Ask when your family members have experienced discrimination, and how they have responded. And once you ask, listen and learn from what your family has to say. When I got off my social justice high horse and asked my family about their experiences with post-9/11 discrimination, I was surprised. We broke open a conversation about Islamophobia, profiling, and police discrimination, even (or especially) in the white suburbs. Respect the experiences, the knowledge, the brilliance in your own family. You may have some radical aunties and not even know it. Why do you care about police brutality, about Black lives, about building a multi-racial movement? Not with the jargon of social justice, racial justice, and movement building. Deep in your heart, why do you care? If you can, show your emotions. Let your family see that this affects you. Talk about the story that broke your heart open, the people you call family, the friends who patiently guided you into this work. Let them know that you cried for two hours after hearing your students talk about the fragility of their lives, that you called in sick to work the day after Darren Wilson’s non-indictment. Let them know that you sometimes worry about your dark-skinned brother. Your own story and process may help guide other people through theirs. Part of widespread, historical, institutional racism in this country is that Black people are seen as less than human. The media certainly isn’t portraying Black victims of police brutality as people; in fact, they’re taking every opportunity to demonize Black victims, and putting them on trial. Shift the narrative. Tell stories about Mike Brown as a person, about Eric Garner’s family. Talk about their parents, their partners, their friends, their kids. If your family doesn’t want to believe you, ask them if they’ve experienced this: Have they been accused of being “terrorists”? Have they been spoken to in mocking, broken english? Have they been denied opportunities because of dehumanizing assumptions made about them? This isn’t the same as the deadly racism that Black people challenge every day, but this is, again, a starting point. Remind your family members that these are real lives at stake, not just statistics. Remind your family that these lives are worth far more than a few cigarillos, or a handful of cigarettes. And do your research ahead of time. Police brutality is hardly a new conversation in America. Know how prisons became the mass industry they are now, how policing and police brutality were developed as forms of control. Know the history of the 1965 Hart-Celler Act, and be able to speak to the ways that South Asians have been used as part of a ‘model minority.’ Know your facts, and your history. These histories are hidden because they speak truth. Being able to paint a historical picture may change people’s minds. For those of us who live and breathe this work and these conversations, we can forget that we all had a learning curve too. Sometimes, we need to start by asking questions: Have you been following the news? What do you think? Are your co-workers talking about this? Our families don’t always have access to the political spaces that we do. They may need the space to start piecing through their own responses, and their own ideas. It can be hard to hear where people are at, and you may not want to listen to your family hash through their racism. But again, this is how we do our part. We ask our white friends to do their work as allies, and to use their white privilege to make waves in white communities. Don’t make Black communities ask the same of us. This is our work, not theirs. 6. Be patient, and listen. Change takes time. You might not convince your racist cousin to change his mind overnight, but you might get him thinking. Your goal isn’t to make your family agree with you in one conversation; you want to start the gears turning, ask the questions that get people questioning their own beliefs. 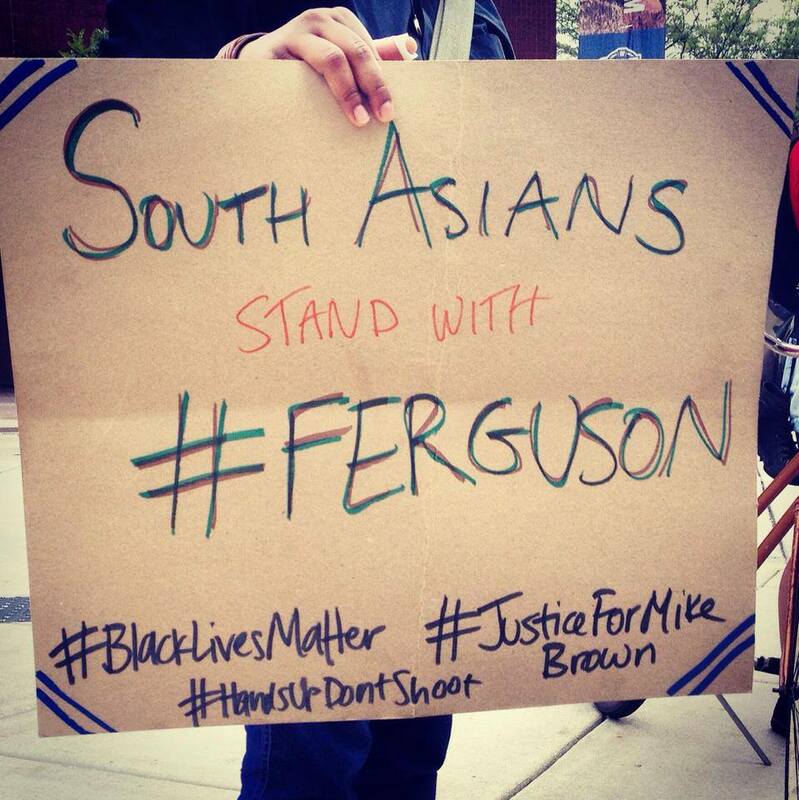 If we’re serious about being #APIs4BlackLives, South Asians who stand with Ferguson, part of a #ModelMinorityMutiny–we need to be patient. We need to be in this work for the long haul. These suggestions aren’t one-size-fits all, and they won’t work for everyone. They are ideas that come specifically from my family’s location in the U.S.: as first-generation immigrants, non-Black South Asians, upper-middle class families, living in the suburbs of L.A. These strategies certainly don’t encompass the diversity of our families, our communities, and our strategies. So please, add your ideas to the mix! I’d love to learn from them, too. What other strategies are you planning on using at your kitchen table? Thanks so much for this. I have been thinking a lot about this + encouraging more people to think about the places we have tended to run from or shun because as you so eloquently said, this is our work. And it has to come from a place of love, not one of blame, shame, or patronizing. Really appreciate this. Header image is from the 7th South Asian Seattle Film Festival, hosted by Tasveer (www.tasveer.org).